On the left navigation bar, click the FRUUGO INTEGRATION menu, and then click Manage Profile. On this page, all the available profiles are listed. Select the check boxes associated with the profiles those are no more required. 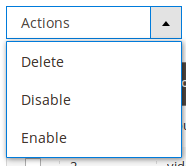 In the Actions list, select the Delete option. The selected profiles are deleted. Note: Admin can also delete the current profile while viewing the details of the profile on the profile editing page. This feature enables the admin to check the details of the profile before deleting it. Click the required row of the profile that is no more required. In the Action column, click the arrow button, and then click Edit. On the top navigation bar, click the Delete button. The current profile is deleted.